Canadian Court Puts A Stop To Expansion Of Major Oil Pipeline (For Now) An appeals court sided unanimously with environmental and indigenous groups in the decision; for construction to resume, the government must comply with court orders that could take years to satisfy. 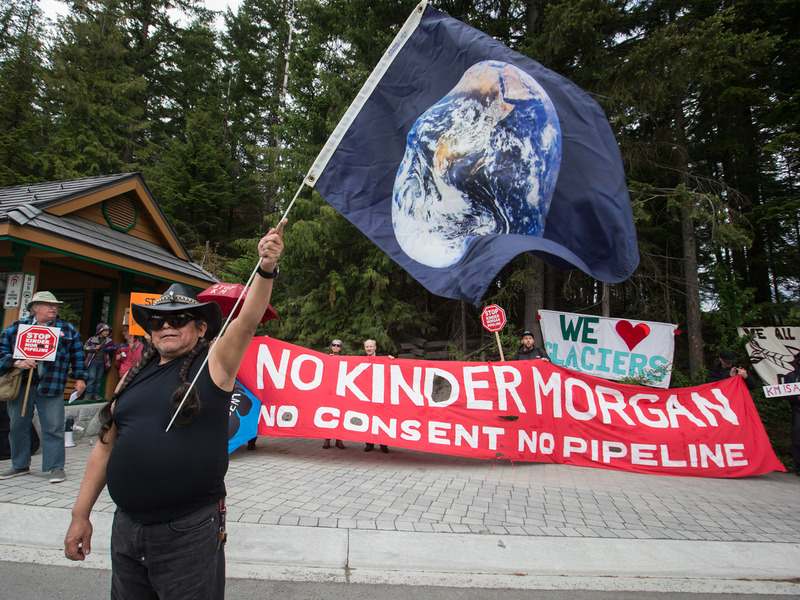 A demonstrator holds a flag with an image of Earth during a protest against the Kinder Morgan Canada Ltd. Trans Mountain pipeline expansion on June 2. On Thursday a Federal Court of Appeal ruled to stop the expansion projects indefinitely. A Canadian court sided unanimously with environmentalist and indigenous groups on Thursday in a decision that indefinitely halts the construction of the controversial Trans Mountain Pipeline expansion project. The ruling by the Federal Court of Appeal reverses the Canadian government's approval of the troubled multibillion dollar project. The court said the government failed to "fulfill the duty to consult owed to Indigenous people." It also concluded that the National Energy Board — the country's energy regulator — unjustifiably excluded "marine shipping from the scope of the Project. As a result, the true environmental effects of the project could not be assessed. In order for infrastructure company Kinder Morgan to resume construction, the court said the energy regulator and the government must comply with its orders, which could take years. Thursday's decision came as a long-awaited victory for First Nations groups, dozens of environmentalist organizations and the city of Vancouver, which filed the legal challenge together. Since 2016 they have suffered multiple legal losses in trying to stop the construction on native lands and in environmentally sensitive areas. "This is a major victory for my community. Until now our rights and our water have been disregarded by Kinder Morgan and the Government of Canada," Coldwater Indian Band Chief Lee Spahan said in a statement. "Thankfully, the court has stepped in where Canada has failed to protect and respect our rights and our water." Opposition groups argue the risks of oil spills in the Salish Sea — home to an already-endangered killer whales — and the potential hazards of increased petroleum tanker traffic are too high a price to pay for an economic boom. Kelly Martin, campaign director of the Sierra Club's Beyond Dirty Fuels team, called it "a testament to the growing power of the movement to fight back against dirty, dangerous tar sands pipelines." "Communities across North America will not back down until Trans Mountain — as well as Keystone XL and Enbridge's Line 3 — are canceled once and for all," she added. The Trans Mountain pipeline connects oil sands facilities from landlocked Edmonton, Alberta, to tank terminals in Burnaby, British Columbia, on Canada's west coast. The expansion project was supposed to extend the 715-mile pipeline and nearly triple the flow of tar oil and other petroleum products to 890,000 barrels a day. Prime Minister Justin Trudeau has hailed the expansion as a key to reducing Canada's reliance on U.S. oil and boosting exports to Asia, and said it would create up to 15,000 jobs. Shortly after the loss in court, Canada got one step closer to purchasing the existing pipeline and expansion project, from Texas-based Kinder Morgan. The company's shareholders voted on Thursday morning to approve the $3.5 billion ($4.5 billion in Canadian currency) sale to the Canadian government in the spring. Trudeau has faced mounting criticism for forging ahead with the purchase in order to guarantee the pipeline's completion. He responded to Thursday's court decision by reiterating his intention to proceed with the project. "Today I spoke with Premier @RachelNotley — and reassured her that the federal government stands by the TMX expansion project and will ensure it moves forward in the right way," Trudeau tweeted. Today I spoke with Premier @RachelNotley - and reassured her that the federal government stands by the TMX expansion project and will ensure it moves forward in the right way. Canada's finance minister, Bill Morneau, echoed Trudeau's sentiments at a press conference on Thursday, saying that "we are absolutely committed to moving forward with this project," but adding that the government had yet to decide whether it would appeal.